1. Wheat: is a staple grain in North India. Wheat in the diet -Adds more fiber that helps to prevent heart disease, diabetes and cancer. The insoluble fiber it contains helps eliminate wastes from the body faster, making it helpful in preventing and treating constipation and diverticular disease. There are many beliefs like wheat is the best for weight watchers as it reduces fat and reduces weight. But without a balance in the diet, wheat alone isn't going to give you all of the nutrients you need, and reduce weight too. 2. Rice: is a staple food in South India. Rice is an excellent source of carbohydrate and contains no gluten. 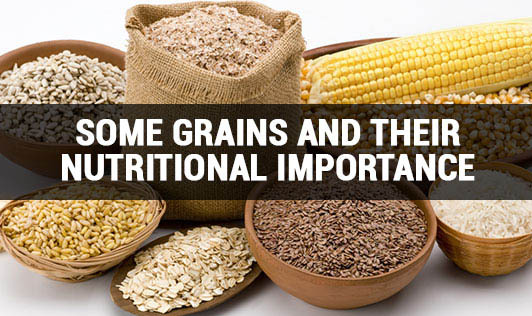 Brown rice has some amount of bran and contains thiamine. Weight watchers who usually think that avoiding rice could help them to reduce weight need not do so, as brown rice in the right amounts can also help you in weight loss. 3. Red gram dal (tuvar dal): is a protein rich food. It contains protein, which is almost three times that of cereals and supplies a major share of protein requirement of vegetarian population of the country. The combination of dal-chawal (pulse-rice) or dal-roti (pulse-wheat bread) is an important part of the average Indian diet. Tur dal is believed to cure cough, acidity, stomach pain and piles. 4. Green gram dal (Moong dal): is the most prized lentil in India due to its health benefits. It has great energy and protein value. Among the pulses and dals, it is most easily digested and is an important element for optimum health. Moong dal is a good body builder food for vegetarians. There is only a small amount of fat which is another advantage over meat products that contain a lot of fat. 5. Bengal gram dal (Channa dal): Is one of the earliest cultivated grains. Channa dal is low in fat and most of this is poly unsaturated fat. Channa dal is a helpful source of zinc, folate and protein. Channa dal can be a good food for people with diabetes because it has a low glycemic index. It's also very high in dietary fiber and hence a healthy source of carbohydrates for persons with insulin sensitivity or diabetes. 6. Black gram dal (Urad dal): makes a part of a nutritious and healthy diet. The main health benefit is that it reduces risk of coronary heart disease and iron deficiency, and helps stabilize the blood sugar levels. Other health benefits include reduction of cholesterol, prevention of constipation and prevention of digestive disorders like irritable bowel syndrome and diverticulitis. 7. Horse gram (kulthi): is one of the lesser known pulses. Horse gram is an excellent source of iron and molybdenum. Horse gram has less importance in the main pulses because horse gram seeds have higher amount of trypsin that breaks down the protein to smaller particles and hemaggluttins that promote the clustering of red blood cells. 8. Field beans (Val): is the seasonal and less common lentil. The myth that Val causes gas and loose motions can be contributed to the fact that Val acts as a laxative and helps in constipation by stimulating evacuation of the bowels easily.